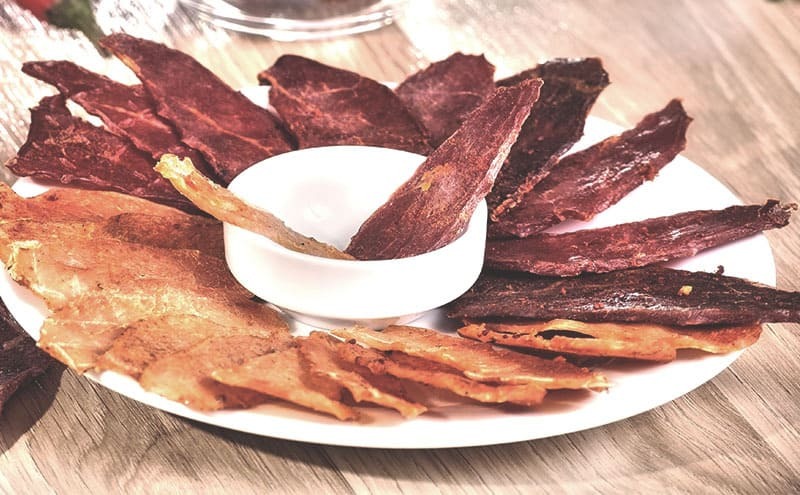 Beef jerky is a popular snack that’s sold online, in food stores, supermarkets and gas stations all over the world. Lean strips of beef are dried, seasoned and cured with salt to preserve it. 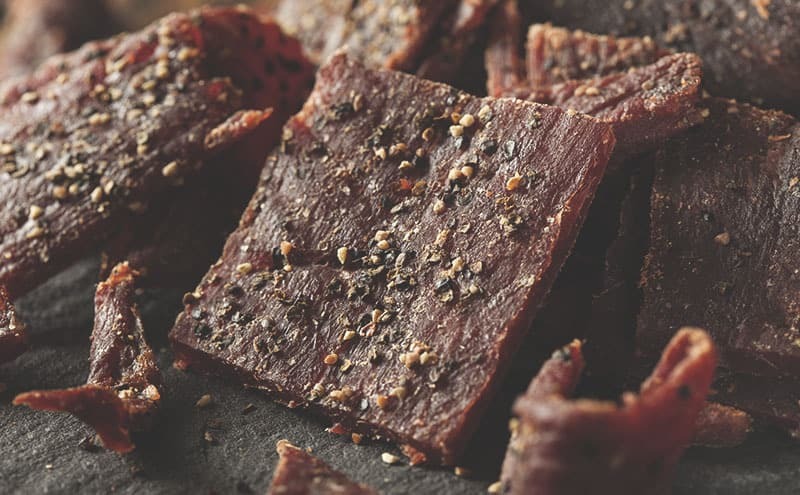 Beef jerky may also be seasoned with various spices to give different flavors, but is it good for you? We’ll look at the nutrition facts to determine whether beef jerky is a healthy snack option. We’ll look at the amounts of each nutrient and how much of each one you should be including in your diet. A 1-ounce (28.35 grams) serving of beef jerky contains 116 calories of which 65.3 calories are from fat. Beef is a red meat that consists of protein and fats and it’s the main ingredient used to make beef jerky. Eating too much red meat isn’t recommended but eating it in moderation is fine. One of the good things with beef jerky is that most of the fat is removed during the drying process. A 1-ounce serving of beef jerky contains 3.1 grams of saturated fat, 3.2 grams of monounsaturated fat and 0.3 gram of polyunsaturated fat. Too much saturated fat is unhealthy and too much of it can lead to high cholesterol and heart disease. There’s not enough of this bad fat in the beef jerky to make it unhealthy. Monounsaturated and polyunsaturated fats are the good fats and not harmful at all. Adding good fats to your diet is beneficial to your health and you should be eating foods that contain these fats. Our body can’t produce these fats and adding them to your diet can help to lower cholesterol and maintain a healthy heart. Due to the fact that beef jerky is cured with salt it does have a high sodium content. A 1-ounce serving of the snack contains 590 milligrams of sodium which is 25 percent of the recommended daily allowance (RDA) for adults. Medial evidence has concluded that high sodium diets aren’t healthy and too much salt can lead to serious health problems. If you’re going to be eating beef jerky regularly you should monitor how much salt you eat on a daily basis. Many foods contain added salt and it’s easy to consume too much so this needs to be avoided. A 1-ounce portion of beef jerky contains 13.6 milligrams of cholesterol and the recommended daily intake is 200 to 300 milligrams. Too much cholesterol can clog up your arteries which can lead to heart disease. As long as you don’t eat too many foods that are high in cholesterol you can eat beef jerky without worrying. A 1-ounce serving of beef jerky contains 169.2 milligrams of potassium which isn’t harmful at all. Potassium is needed to maintain a healthy body and most people get it from their normal diet. There’s no recommended daily allowance for potassium and deficiencies are rare. In a 1-ounce serving of beef jerky there’s 3.1 grams of carbohydrates and some of these come from the flavoring. The carbohydrates are made up of 2.6 grams of sugar and 0.5 grams of fiber. These amounts make beef jerky a low carbohydrate snack which is preferable to other snacks that are available. Protein breaks down into amino acids in the intestines which is then used to build tissues and enzymes. A 1-ounce serving of beef jerky contains 9.4 grams of protein which is around 5 percent of the recommended daily allowance. Healthy males should be getting 55 grams of protein and females should be getting 46 grams. A lack of protein can lead to various health problems including heart disease, fatigue and muscle wasting. If you’re not getting enough protein from your diet it’s useful if you can get a percentage of it from a tasty snack. Beef jerky also contains a number of vitamins and minerals and some of them are essential to maintain a healthy body. Vitamin B12 helps to keep nerves and blood cells healthy and vitamin B6 helps with the body’s metabolism. A 1-ounce serving of beef jerky contains 0.1 milligrams of B6 (4 percent RDA) and 0.3 μg of B12 (12 percent RDA). Niacin (vitamin B3) is a water-soluble vitamin that’s not stored in the body so we have to get it daily from food. Niacin helps the body to use carbohydrates, fats and protein to make energy. A 1-ounce serving of beef jerky contains 0.5 milligrams of niacin which is 3 percent of what you need every day. Folate is a natural form of vitamin B9 and it’s found in greens such as spinach, kale and turnip tops. This essential vitamin encourages cell and tissue growth and it has a number of health benefits. A 1-ounce portion of beef jerky will give you 38 μg of folate which is 10 percent of your RDA. Beef jerky also contains traces of vitamin D, vitamin E (1 percent RDA) and vitamin K (1 percent RDA). Beef jerky is a good source of iron which is essential for moving oxygen around the body in our blood cells. A 1-ounce portion of beef jerky contains 1.5 milligrams of iron which is 20 percent of the recommended daily allowance. The iron content makes beef jerky a good snack choice if you have an iron deficiency. Zinc is another mineral that the body needs to support the immune system and its essential for cell division. A 1-ounce serving of beef jerky contains 2.3 milligrams of zinc which is 16 percent of the recommended daily intake. Calcium is essential for healthy teeth and bones and it’s needed for blood clotting. A 1-ounce portion of beef jerky will give you 5.7 milligrams of calcium which is 1 percent of the recommended daily allowance. Beef jerky also contains 14.5 milligrams magnesium (5 percent RDA) which can help to prevent high blood pressure. Beef jerky also contains phosphorus and a 1-ounce serving contains 115.4 milligrams which is 12 percent of your recommended daily allowance. The human body needs phosphorus to filter waste and to repair damaged cells. If your phosphorus levels are too high or low you could suffer from joint pain or chronic fatigue. Copper is an essential trace mineral used by the body to make red blood cells and to maintain the immune system. Copper also helps the body to absorb iron and make collagen. A 1-ounce portion of beef jerky has 0.1 gram of copper which is 4 percent of the recommended daily intake. Beef jerky also contains a trace mineral called selenium which is found in some foods. Selenium helps the body to make antioxidant enzymes which prevent cell damage. A 1-ounce serving of beef jerky contains 3 μg of selenium which is 5 percent of your recommended daily allowance. Choline is a micronutrient which the body makes in small quantities but we also need to get it from food. Choline is found in eggs, beef, greens and salmon and it’s important to maintain healthy liver function. A 1-ounce serving of beef jerky contains 30.9 milligrams of choline which is 6 percent of your recommended daily allowance. Beef jerky also contains a small amount of water and a 1-ounce serving contains 6.6 grams. It’s worth noting that the facts and figures are based on a 2000 calorie per day diet and they’re only a guide. If your calorie intake is lower or higher these figures will be different. Many companies manufacture beef jerky and they use a wide range of flavorings to give customers some variety. The result is that each brand of beef jerky is different and contains different things. The only way to know for sure what’s in the beef jerky is to read the packaging. You’re also able to buy low-sodium beef jerky as well as organic and gluten-free varieties. Low-sodium beef jerky is a good option if you have high blood pressure or a heart condition. Organic products are now very popular and there are a number of organic beef jerky products on the market. What Are the Benefits of Eating Beef Jerky? There are some good reasons to eat beef jerky when you feel like a snack between meals. Beef jerky contains fewer calories than many other snacks but still has some nutritional value. If you can get some nutrients from a low-calorie snack it has to be beneficial. Another benefit of eating beef jerky is that it’s made from raw beef instead of cooked beef. Raw meat is much easier to digest than cooked meat and the nutrients in the jerky will be absorbed quicker. If you can get nutrients into your body quickly you’re going to get the maximum benefit from them. The protein and nutrients in beef jerky may also give you more energy throughout the day. Eating a high energy snack such as beef jerky before working out may enhance your workouts. You can also snack on some beef jerky after your workout to give an energy boost and reduce sluggishness. Beef jerky also lasts better than other snacks when the pack has been opened. Due to the fact that the jerky has been dried and cured it doesn’t begin to deteriorate like other snacks. NASA gave packs of beef jerky to shuttle astronauts because it was a high energy snack that lasts without being refrigerated. Should I Eat Beef Jerky? After looking at the nutrition facts you can eat beef jerky in moderation and it’s not going to harm you. 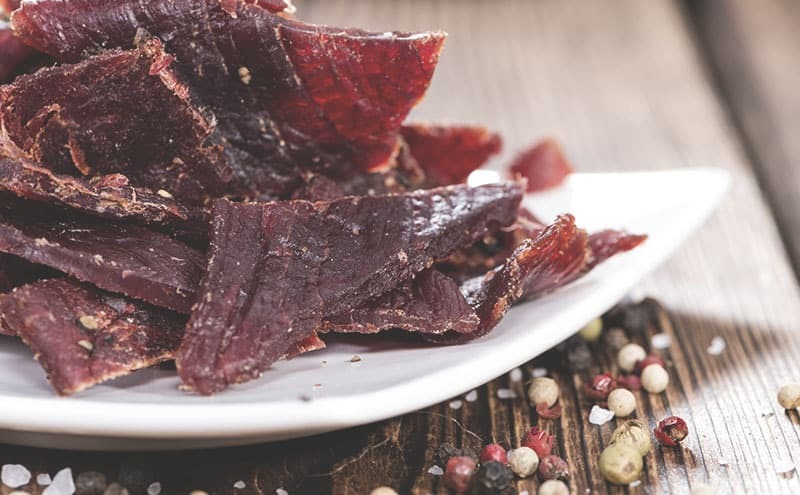 Beef jerky is a high energy snack that’s a good source of protein, vitamins and essential minerals. There’s not enough fat or cholesterol in beef jerky to make it unhealthy and it’s also low in carbohydrates. If you enjoy a snack then some beef jerky is a better choice than other snacks that are available. Having a single serving (1 ounce) of beef jerky is better than grabbing some donuts or a bag of potato chips. Many of the snacks that we eat contain additives and preservatives which are unhealthy. The only downside is that beef jerky has a very high sodium content which may cause health problems if you eat too much of it. If you have high blood pressure you should limit the amount of beef jerky you eat due to its sodium content. You should also check the ingredients on the packet to make sure you’re not allergic to any of them. What Is the Best Quality Beef Protein Powder in 2019? The Condiment Quandary – What Are The Healthiest Condiments?